Currently starring in a brand new TV series Pitch Slapped, airing weekly around the globe on Lifetime. Pitch Slapped is set to premiere in the UK and Ireland on Lifetime UK, in Israel under the name 'A cappella Battles' , in the Philippines and Indonesia under the name 'Pitch Battles' on Lifetime Asia. Pitch Slapped will also premiere throughout Latin America in 2017 under the name 'Batalhas A cappella' on Lifetime Latinoamerica and in Brazil on Canal Lifetime Brasil. Diana Preisler is a Singer, Actress, Voice-Over Actor, and Performance Coach. 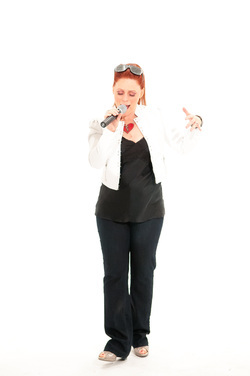 As Blue Jupiter’s resident a cappella rockstar, her singing voice defies categorization, spanning Broadway, jazz and pop. As a prolific voice actress, her speaking voice is heard on national commercials and TV shows. And, as a performance coach, her wise words are a call to action, encouraging and inspiring the next generation of performers to greatness. Diana tours the world as Blue Jupiter’s fearless female lead singer. More than just a powerful voice on stage, Diana also manages and coaches her professional a cappella band. Her leadership spear-headed Blue Jupiter’s rise to fame by winning the Oreo Cookie commercial contest, produced by American Idol’s Randy Jackson. Diana’s management led Blue Jupiter to six tours in Asia, including a 3-month headlining spot at the Sands Casino in Macau China, a residency at the Shanghai American School, and a celebration of Independence Day by singing for 10,000 US soldiers in Okinawa Japan, on July 4th. Thanks to Diana’s guidance, Blue Jupiter has thrived as headliners at corporate and private events, fairs, music festivals, universities and recurring headliners for Royal Caribbean. It’s through Blue Jupiter that Diana found her calling as a performance coach and mentor. What started as a series of workshops and master-classes dubbed “Rockstar 101,” has grown to Diana’s full-service performance development company called “The AcaShop.” Through The AcaShop, Diana mentors and coaches a cappella groups of all abilities and takes them to the next level. Whether it’s preparing for a concert, producing an album, or full-blown artist development, Diana along with her team at The AcaShop, is transforming a cappella groups across the nation. 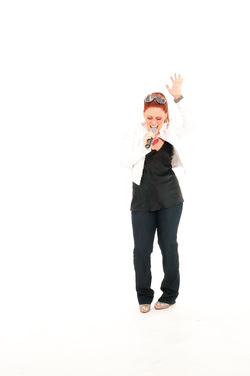 Her expertise and experience on and off the stage has given Diana the reputation as one of the most respected a cappella coaches in the industry. Diana can often be found sitting on panels of experts and judges for prestigious a cappella competitions around the country, including, The Harmony Sweepstakes, ICCA and ICHSA’s, SingStrong’s AcaIdol, the Bijou Blender, and more. The odds are, you’ve seen or heard Diana before. She’s graced the theatrical stage on multiple national Broadway tours such as “Fiddler on the Roof” and “A Christams Carol.” Regional roles across the US include Eva Peron in "Evita", Ado Annie in Ado Annie in "Oklahoma", Dorothy in “The Wizard of Oz”, Linda in “Blood Brothers” and Shelley in "Bat Boy, The Musical." If you missed her on stage, then you’ve surely heard Diana as the voice of MTV, Nickelodeon, Behr Paint, Coca-Cola, McDonald's, Herbal Essences, Priceline, Planter’s (with Robert Downy Jr), Fisher Price, HGTV, VH1, or Bank of America (to name just a few.) Quite likely, you’ve heard Diana ask for your account number when you call into your bank, credit card, or phone company. And, if you saw the Oscar-nominated animated feature film, “Chico and Rita,” then you heard Diana as one of two featured American characters. Gamers will know her voice from several video games, including the hits “Saint’s Row 2,” “Mission US 2 'Flight to Freedom',” “Mission US 4 'City of Immigrants'” as well as many interactive educational web applications and software titles. Pre-schoolers adore Diana’s singing voice on Wallykazaam, featured as multiple characters. And toddlers love to hear Diana’s voice every time they squeeze one of Bright Starts "The Giggling Gourmet" toys. The squeezable teddy bear and its line of kitchen tools are voiced by Diana, singing and talking about food, cooking, shapes and colors! When Diana isn’t lending her voice to Blue Jupiter, a Broadway show, or a TV program, she is an active co-producer of SingStrong: an international weekend-long charity music festival featuring a cappella groups from all over the world. Click here to read a review of the festival (psst...look at #6). Diana holds a BA in Theatre Performance and Directing from the State University of New York at Oswego where she sang in the award-winning vocal ensemble, "State Singers" collegiate jazz a cappella group, under the direction of Stan Gosek. Click: Star of LifetimeTV's new TV show Pitch Slapped!